I Know Where the Book of Mormon Came From! What should I know about the Restoration of the Church? And we talk of Christ, we rejoice in Christ, we preach of Christ, we prophesy of Christ, and we write according to our prophecies (2 Nephi 25:26). What are your favorite stories of Jesus? Do you like the story of His birth? Have you read about how He calmed the stormy sea? Did you know He healed a blind man and raised His friend Lazarus from the dead? Have you read about how He loved the children? Stories of Jesus are found in the scriptures. Nephi, a Book of Mormon prophet, wrote, “And we talk of Christ, we rejoice in Christ, we preach of Christ, we prophesy of Christ, and we write according to our prophecies” (2 Nephi 25:26). Heavenly Father commanded His prophets to testify of His Son, Jesus Christ, and keep sacred records so we can learn about Jesus. The prophets have asked you to read the scriptures every day. During the month of December, read about Jesus’s birth and the miracles He performed. Talk with your family about the precious gift of the Atonement. As you learn the stories of Jesus, you will be blessed to feel His love for you and your testimony of His gospel will grow. Each day during December look up the scripture reference on that day’s set of small scriptures on page 10 and read the stories of Jesus. Then color the set of scriptures for that day. Each day also lists a picture from the Gospel Art Picture Kit (GAK) that can accompany the story. Share your favorite stories of Jesus with your family. Note: This activity may be copied or printed from the Internet at www.friend.lds.org. There won’t be a Primary poster in the January 2009 issue, but look for a surprise in April! (Note: All songs are from Children’s Songbook unless otherwise noted; GAK = Gospel Art Picture Kit, TNGC = Teaching, No Greater Call.) Monthly Theme: I am a spirit child of Heavenly Father. Before sharing time, photocopy and enlarge the picture from Primary 6, lesson 46, p. 211. Make enough copies for the children to color and take home to share the activity with their families. Begin sharing time by holding up a Bible and a Book of Mormon. Ask the children to identify the two books. Play a simple guessing game by stating the name of a prophet and asking the children to identify which set of scriptures includes the story and teachings of that prophet (Noah﻿—Bible, Lehi﻿—Book of Mormon, and so on). Place the enlarged copy of page 211 on the chalkboard. State the weekly gospel principle: “The prophets foretold Jesus Christ would come to the earth.” Read the names of the five prophets on the enlarged copy, and tell when they lived on the earth. Ask the children to identify which book of scripture each prophet is from. Invite individual children or assign classes to find the scriptures listed: Isaiah 7:14; 9:6; Micah 5:2; 1 Nephi 11:18–21; Alma 7:9–10; and Helaman 14:1–6. Read each scripture reference. Give each child a copy of the handout, and provide crayons for them to color the page. Conclude sharing time by singing the first verse of “The Nativity Song” (pp. 52–53). Bear testimony that the scriptures are the word of God and that they testify of the birth of Jesus Christ. Write the weekly gospel principle on the chalkboard, and read it together: “The prophecies were fulfilled. Jesus Christ was born and the righteous rejoiced.” Define the word prophecy. (Remind the children of the prophecies found in the Bible and Book of Mormon foretelling Jesus’s birth [see sharing time idea 1]). Read the weekly gospel principle again. Ask the children to think about the stories of Jesus’s birth from the Bible and the Book of Mormon. Name some of the righteous people who rejoiced at His birth. Help the children recognize that the righteous rejoice today as we celebrate Jesus’s birth. Talk about ways we can rejoice as we celebrate His birth. Teach the chorus of “Oh, Come, All Ye Faithful” (Hymns, no. 202). Bear testimony of the scriptural accounts of Jesus’s birth. Invite two children to hold GAK Jesus the Christ and GAK Joseph Smith. Repeat the weekly gospel principle together as a Primary: “Jesus Christ restored His gospel through the Prophet Joseph Smith.” Place the two pictures on the chalkboard. Read 3 Nephi 27:13–16. Help the children understand that the word gospel means good news, and the good news is the birth, life, and mission of the Savior Jesus Christ. Write the word gospel on the chalkboard. 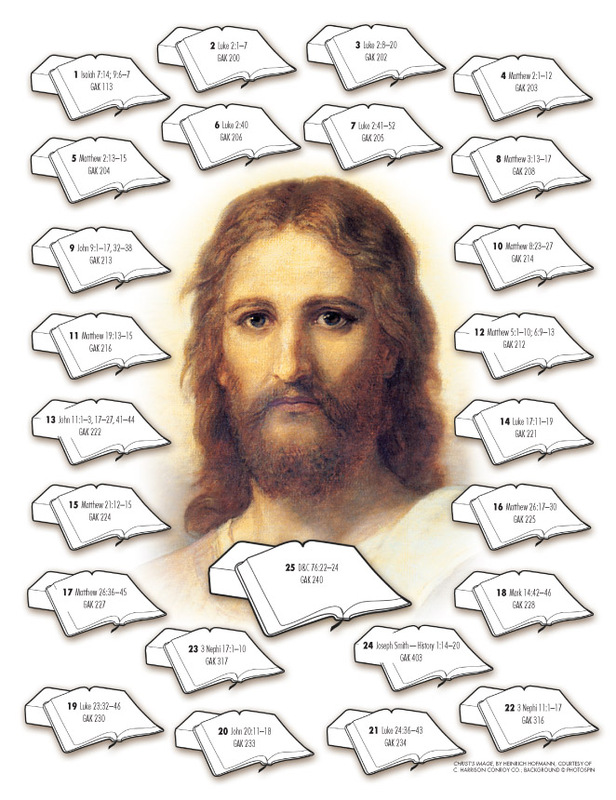 Play a musical guessing game to discover six of the many blessings we receive because of the gospel of Jesus Christ (priesthood, scriptures, baptism, Holy Ghost, prophets, and temples). Choose Primary songs that are familiar to the children and that describe these blessings. Ask the pianist to play the first few notes of the song. Have the children guess the song, adding more notes as needed. When the children have guessed the song and the blessing, sing the song together. If time allows, provide paper and pencils or crayons for the children to draw a blessing they receive because of the gospel of Jesus Christ. Conclude by bearing testimony of the Prophet Joseph Smith and of the Savior. Before sharing time, create several case studies to help children practice making good choices (see “Case Studies,” TNGC, 161–62). Begin sharing time by helping the children find 3 Nephi 27:21 and reading it together. Emphasize the phrase “For that which ye have seen me do even that shall ye do,” and discuss why it is important to try to be like Jesus. Sing “The Church of Jesus Christ” (p. 77). Share several examples of children who are trying to be like Jesus (see “Trying to Be Like Jesus” articles from the Friend, or share examples of children from your Primary making good choices). Sing the last line of “The Church of Jesus Christ” between each example. Place a picture of a child and a picture of the Savior on the chalkboard, and repeat the weekly gospel principle: “Because I know that I am a child of God and that Jesus Christ is my Savior, I will …” Give each class a case study. Invite each class to read the case study and decide how to solve the problem by making good choices. Provide time for each class to share its case study and solutions with the Primary. Conclude by singing “The Church of Jesus Christ.” Bear testimony of how knowing that you are a child of God and that Jesus Christ is your Savior helps you make good choices every day. Friend references: “Prophets,” May 2003, 32; “Isaiah Prophesies of the Savior,” Dec. 2001, 36; “Sing a Song of Joseph,” May 2007, 4–6; “Trying to Be Like Jesus,” Jan. 2007, 16–17; Mar. 2007, 46–47; Apr. 2007, 40–41; Sept. 2007, 36–37.